We’re happy that this clip highlights the importance of helping kids get an early start on good oral hygiene. And, according to authorities like the American Dental Association and the American Academy of Pediatric Dentistry, age 3 is about the right time for kids to begin getting involved in the care of their own teeth. Of course, parents should start paying attention to their kids’ oral hygiene long before age three. In fact, as soon as baby’s tiny teeth make their first appearance, the teeth and gums can be cleaned with a soft brush or cloth and a smear of fluoride toothpaste, about the size of a grain of rice. Around age 3, kids will develop the ability to spit out toothpaste. That’s when you can increase the amount of toothpaste a little, and start explaining to them how you clean all around the teeth on the top and bottom of the mouth. Depending on your child’s dexterity, age 3 might be a good time to let them have a try at brushing by themselves. Ready to help your kids take the first steps to a lifetime of good dental checkups? Place a pea-sized dab of fluoride toothpaste on a soft-bristled brush, and gently guide them as they clean in front, in back, on all surfaces of each tooth. At first, it’s a good idea to take turns brushing. That way, you can be sure they’re learning the right techniques and keeping their teeth plaque-free, while making the experience challenging and fun. Most kids will need parental supervision and help with brushing until around age 6. As they develop better hand-eye coordination and the ability to follow through with the cleaning regimen, they can be left on their own more. But even the best may need some “brushing up” on their tooth-cleaning techniques from time to time. What about flossing? While it’s an essential part of good oral hygiene, it does take a little more dexterity to do it properly. Flossing the gaps between teeth should be started when the teeth begin growing close to one another. Depending on how a child’s teeth are spaced, perhaps only the back ones will need to be flossed at first. 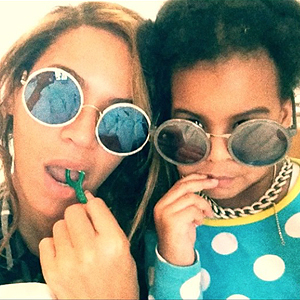 Even after they learn to brush, kids may still need help flossing — but a floss holder (like the one Beyonce is using in the clip) can make the job a lot easier.